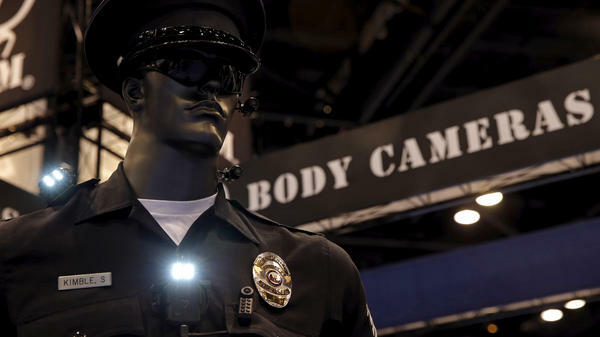 Police body cameras are seen on a mannequin at an exhibit booth by manufacturer Wolfcom at the International Association of Chiefs of Police conference in Chicago, on Oct. 26. Steve Tuttle, a spokesman for the company, says that's to avoid recording what an officer was saying right before an incident. "It's video-only at that point. We want to protect the officers' privacy, because those private conversations could take the context out of what they were saying, especially a joke," Tuttle said recently during an expo in Chicago at the annual conference of the International Association of Chiefs of Police. Police unions like this feature. But reformers say this means Taser cameras will miss sounds, such as a telling comment inside the squad car, that could explain why an officer decided to pull someone over. Who Do The Cameras Serve? Other cameras have features that are just as contentious. A company called Safety Vision makes a camera with a monitor on it. "This makes it very easy for the officer to go back, in the field, after he made a recording, and actually review, recollect everything that just happened, and that way his report's going to be accurate," said Mike Tennon, who was working at the company's booth at the expo in Chicago. It may seem like a convenient feature, but it's actually part of a heated debate over whether officers should be able to view their videos before writing their incident reports. In New York City and California, reformers say officers should not be allowed to view their videos before writing reports, because they might tailor their reports to what the camera caught — and didn't catch. And here's another basic question: Should a camera show that it's on? Should there always be a blinking red light? On the Safety Vision camera, it's an option: "We can go to a complete stealth mode where there are no lights on at all," Tennon said. Other companies take the opposite tack. Instead of "stealth mode," their cameras' screens are turned outward so civilians can't miss the fact that they're on camera. Those companies say this enhances a camera's deterrent effect, sort of like people seeing themselves on security monitors as they walk into a store. Travis Reddy is CEO of an Australian company called Strategic Systems Alliance. He says decisions about privacy are localized in the U.S., coming down to state laws and police department policies — which is why his company has made its cameras more programmable. "We're here to enable the policies that need to be implemented, so give them the flexibility to go either way," Reddy said. "(That's the) great thing about software." His company's cameras are essentially computers, running on the Android operating system. The thing about programmable cameras, though, is that they may end up doing a lot more than anyone expected. For instance, the Strategic Systems Alliance cameras can read license plates and faces. "As I wear this and walk around, it's checking all the faces I walk past and all the vehicles I walk past and notifying me if any of those people are on my watch list," Reddy said, walking around the expo floor. Reformers pushing for body cameras may not have anticipated full-time facial recognition. The way Reddy sees it, though, it's features like this that will get cops to want the cameras. "We see it as important for the rank and file officer to see the value in it, other than just repeatedly being used against them in the court," Reddy said. "The technology has the ability to actually assist them to do their job and not just be a passive observer of what's occurred," Reddy said. Police departments shopping for body cameras right now face a bewildering range of choices, with at least a couple dozen brands and configurations to choose from. Purchase decisions are often based on brand or cost, as well as what kind of data management services the company offers. Outfitting a whole police force with cameras will quickly generate terabytes of video, and the storage and management of all that data can represent two-thirds of the cost of a camera program. Departments are looking for systems that reduce that cost and simplify the "back end" of a camera system. What the departments may not realize, however, is that, depending on the features that come with their new cameras, their choice of system is also a decision about how the cameras will be used, and for what purpose. With the recent pressure on police to wear body cameras, one thing is over often overlooked. The cameras are not all treated equal. NPR's Martin Kaste went to a police gear trade show this week where he discovered that cameras vary a lot. Those variations can have a profound effect on how the cameras are used and who benefits from them. MARTIN KASTE, BYLINE: The big dog in the body camera business these days is Taser. That was pretty clear this week in Chicago in the exhibitors' hall at the police chiefs' convention. STEVE TUTTLE: We call it, actually, the Taser experience. KASTE: That's the spokesman, Steve Tuttle, at the Taser booth, though booth doesn't really describe it. It looked more like the entrance to Space Mountain at Disneyland, and the police chiefs were just lining up to get in. TUTTLE: The seats all vibrate. We have professional actors that tell a story in the "Star Wars" theme, and we have a hologram that comes up that interacts with the crowd. And when they are done, they receive an astronaut doll has a light-up figure, and - it's huge. KASTE: The point of all this, of course, is to impress the chiefs with the futuristic features available on Taser products. But when you're talking about police cameras, these features aren't just fun technology, they can be contentious. Take the buffer function. Most cameras buffer. They save video of what happened just before an officer pressed record. But Taser's buffer does not include sound. Tuttle says that's to avoid recording what an officer was saying right before an incident. TUTTLE: We want to protect the officer's privacy 'cause those private conversations could take the context out of what they were saying, especially if they were making a joke. KASTE: The police unions like this feature, but reformers say it also means Taser cameras will miss crucial sounds - maybe a telling comment inside the squad car, sounds that might explain why an officer decided to pull someone over. Other body camera features can be just as contentious. MIKE TENNON: We actually have a monitor on the back of our camera. KASTE: That's Mike Tennon at the booth for a company called Safety Vision. TENNON: This makes it very easy for the officer to go back in the field after he made a recording and actually review, recollect everything that just happened. And that way, his reports are going to be accurate. KASTE: This is a big fight in some of the jurisdictions that are considering cameras. That's because a built-in screen like this may allow an officer to check his memory, but it also allows him to check if the camera caught him doing something wrong before he writes his report. Then there's this question. Should a camera show that it's on? Should there always be a blinking red light? On Tennon's camera, that's an option. TENNON: We can go - we can use that, but we can also go to a complete stealth mode where there are no lights on at all. KASTE: Other companies take the opposite tack on this. Instead of stealth mode, their camera screens turn outward so the civilians really can't miss the fact that they're on camera. Those companies say this enhances a camera's deterrent effect. It's sort of like seeing yourself on the security monitors as you walk into a store. Travis Reddy is the CEO of an Australian company called Strategic Systems Alliance, and he says these questions about privacy are very localized here in the U.S. It often comes down to state laws and police department policies, and that's why they've made their cameras more programmable. TRAVIS REDDY: We're here to enable the policies that need to be implemented. So give them the flexibility to go either way - great thing about software. KASTE: His cameras are basically computers running on Android. The thing about programmable cameras, though, is that they may end up doing a lot more than anyone expected. For instance, these cameras can read license plates, and they can read faces. REDDY: And as I wear this and walk around, it's checking all the faces I walk past and all the vehicles I walk past and notifying me if any of those people are on my watch list. KASTE: Full-time facial recognition, it's a feature that may not have been anticipated by the reformers pushing for body cameras. The way Reddy sees it though, it's features like this that will get the cops to want the cameras. REDDY: We see it's important for the rank and file officer to see the value in it other than just repeatedly being used against them in the court. The technology has the ability to actually assist them to do their job and not just be a passive observer of what's occurred. KASTE: Police departments shopping for body cameras right now face a bewildering range of options. There are at least a couple of dozen brands and configurations they can choose from. And when they buy one, it's not just a matter of picking a brand or a price. They're also making decisions about what these cameras are going to be for. Martin Kaste, NPR News. Transcript provided by NPR, Copyright NPR.